It’s not often that you can pinpoint the beginning of an obsession. My obsession with Richard III began in around 1978 in the library at Lalor North High School in the northern suburbs of Melbourne. I picked up a detective novel by an author I’d just discovered. But, this was no ordinary detective novel. This was The Daughter of Time by Josephine Tey. Since then, I’ve read the book at least a dozen times, it’s become one of my favourite comfort reads. I’ve gone on to read many other books about Richard III, the Wars of the Roses & medieval history, both fiction & non fiction. 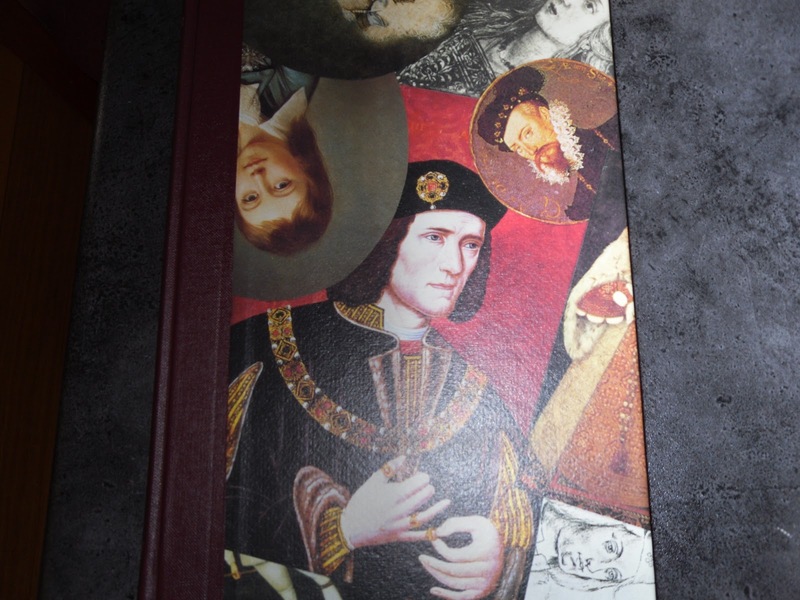 I’ve joined the Richard III Society. All this because I read a slim book about a detective, stuck in a hospital bed after injuring his back chasing after a criminal, who relieves his boredom by investigating one of the greatest crimes in history – the murder of the Princes in the Tower. Inspector Alan Grant features in most of Josephine Tey’s detective novels. He’s a detective in the style of Alleyn & Campion – urbane, civilised, handsome & intelligent. Lying in his hospital bed, bored with the pile of novels given to him by well-meaning friends, he’s visited by Marta Hallard, an actress who became a friend after Grant retrieved her emeralds from a thief. She brings him a pile of prints, portraits of famous historical figures who were the principals in classic mysteries. Grant can’t do any physical detecting but why shouldn’t he exercise his brain on a classic historical mystery instead? Look, Mr Grant, let’s you and I start at the very beginning of this thing. Without history books, or modern versions or anyone’s opinion about anything. Truth isn’t in accounts but in account books. Brent goes back to the original sources & they discover that most of the stories told about Richard were written to please the Tudor dynasty after Henry Tudor defeated Richard at the Battle of Bosworth in 1485. History is written by the victors & Thomas More’s account of events he was too young to have witnessed influenced Shakespeare who wrote the play that has defined mainstream opinion of Richard as a traitorous hunchbacked murderer of innocents ever since. Grant & Carradine realise that much of the history they learnt at school is just wrong, manipulated by the victors & accepted as fact, which is where Tonypandy comes in. Tonypandy is a village in Wales where government troops were said to have shot striking miners in 1910. The facts were quite different & Tonypandy becomes shorthand for every falsehood written down in history books & taught in school as gospel truth hundreds of years after the fact. 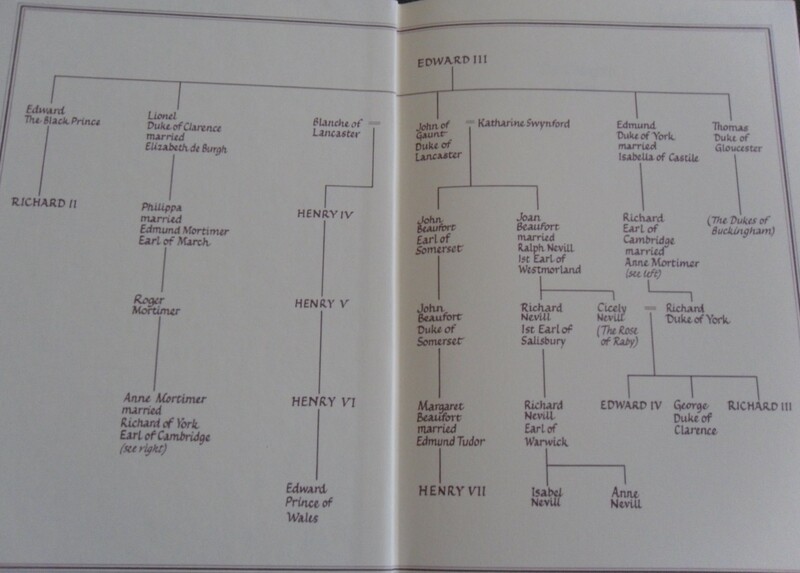 The result of their research is that Grant & Brent conclude that Richard had nothing to do with the Princes’s deaths & that they probably survived him & were murdered by order of Henry VII. Josephine Tey paints such a heroic picture of Richard & such a dastardly one of Henry that thousands of readers have been convinced of Richard’s innocence on the strength of this one book. 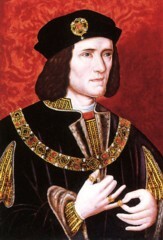 Many people cite the novel as the beginning of their fascination with Richard & it leads many to join the Richard III Society. Of course, The Daughter of Time is fiction. It was published in 1952 & research has uncovered a lot more information about the period since then. Vital contemporary sources such as Dominic Mancini’s account of life in London at the crucial period when Richard assumed the throne weren’t discovered until after the book was published. The “white” version of Richard’s story promoted by early Ricardians to counteract the extremely “black” version of More & Shakespeare is just as biased. After reading The Daughter of Time, Richard was my hero. I believed that he was a noble, kind, wise, generous man who would never have killed his own nephews & who only took the throne because he believed he was the only legitimate heir. Over the last 30 years, I’ve read dozens of books & articles about Richard & I lean more towards a “grey” version of the legend now. The 15th century was a brutal period when violence was often seen as a solution to a dispute & power was the ultimate goal. Richard was no different & probably no more scrupulous than any other prince of his time. I don’t believe there will ever be a definitive account of the death of the Princes now but the fact that they were never seen alive after about August 1483 (two months after Richard’s accession) is a damning fact that does not go away, no matter how many books I read that paint Richard as more sinned against than sinning. However, the fact that my feelings about the historical Richard have changed can’t diminish my enjoyment of this wonderful novel. I still read it at least once a year, for the nostalgic picture of London in the 1950s, to read about the excitement of research & to visit Alan Grant in his comfortable hospital bed, eating rissoles & rhubarb, rewriting history in the most entertaining detective novel ever written. I read this last year and really enjoyed it, especially since I studied some history in university. Sad to know it's not actually true, but I did love the combination of history and mystery! I first read this in my teens and have re-read it several times since. Wonderful book! and I too love all of Josephine Tey. I remember the first time I read this in my teens and feeling just the way you did about it, after all the black legends a white version was so alluring. I no longer have a copy - but think I need to look out for one. Hayley, the US paperback edition is lovely. That's it on the left in the first photo. The other copy is my ancient Penguin paperback from the 70s. 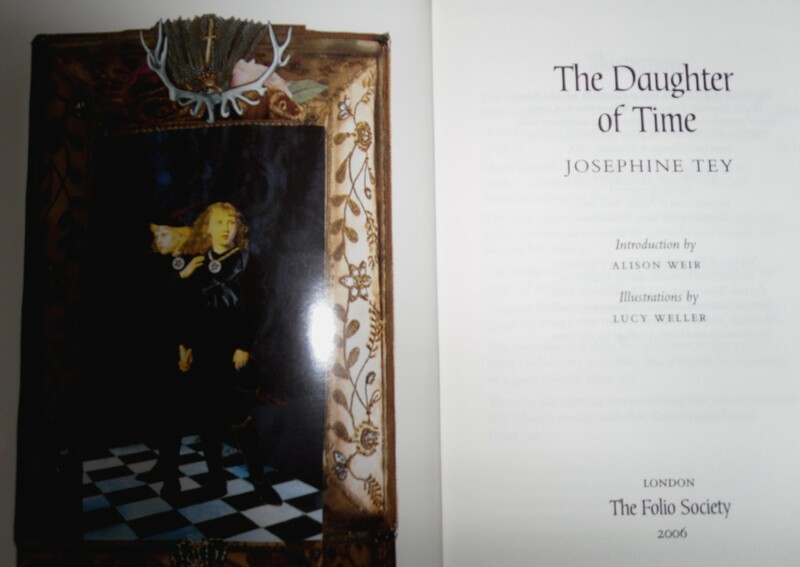 I also have the Folio edition but I don't like the illustrations, apart from the title page incorporating Millais's picture. The illustrations are photo collage & I think they're just not my taste at all. I need to find time to reread the rest of Tey! I also read this book a year or two ago. The premise is good and it really kept me interested. Unfortunately, being from an English working-class background, Tey's obvious middle-class prejudices rather irritated me - for example her view of the British "bobby". I then did some research of my own on the facts of Tonypandy and discovered that Tey's version is as faulty and biased as the propagandistic version that she criticises! However, this only shows that we should be skeptical of *everything* we read - including novels pointing out the importance of being skeptical. Geoffrey, I agree that Tey's prejudices show but that's true of any book, especially the middlebrow middle class books of the 20s & 30s that I love. She doesn't include some anti-Richard material in the book but she is writing fiction. 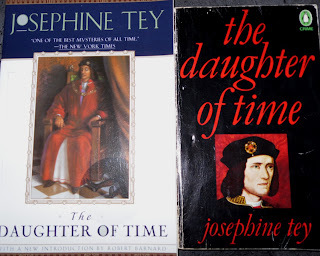 I don't believe she imagined the book would be so influential & that it would lead so many people to do more reading & join the Richard III Society. Amazing for a detective novel. Hello Caroline, thanks for commenting. I agree with you about the delights of reading about Richard. I think Elizabeth Woodville was either pushed or strongly encouraged into that convent. I can't believe she went willingly, especially as her daughter had just had a son & she could have expected to play some role at Court. Maybe Margaret Beaufort was jealous of her beauty?! 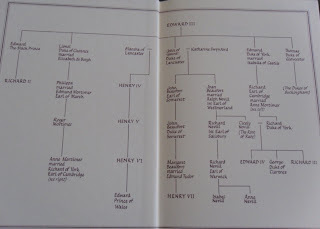 I'd like to blame Henry for the murder of the princes but where did they go after 1483? I've read all the books you mention. I enjoyed the Lymond books & her Macbeth book (Macbeth's another obsession of mine, it's my favourite Shakespeare play) but I'm not passionate about them. I don't think I could reread them. Have you read DD's detective/suspense novels? I read them a very long time ago. I loved Penman & Belle. I loved Pamela Belle's Civil War trilogy too. I've been to York, visited Monk Bar & gave my verdict. I like to think the Northerners were right about Richard, he's certainly a fascinating enigma. Oh, I'd forgotten that PB had started writing science fiction. I was wondering last night what had happened to her when I realised the Civil War books were written 20 years ago. I'll have to investigate. Have you read Ann Bridge's Julia Probyn books? They're travel/suspense fiction, in the style of the Johnson books or Mary Stewart. Bloomsbury have recently released them as e-books. Click on Ann Bridge in my tags list to read my reviews. I hope you find a new author. Oh my goodness - I was just reading an article in which they've found the bones of Richard III and it made me think of Tey. She too had me convinced of RIII's innocence because of Inspector Grant. How lovely to see I'm not the only one. Tonypandy, indeed! Won't it be wonderful if the skeleton really is Richard? The discussions that will result will just go on & on. I can't wait. I think I'm one of the many who joined the RIII Society because of this book. And nearly 5 years after the last comment was published, and for the first time, I'm reading Tey's compelling book. From black to white to grey indeed. Richard's history is fascinating. Anything that prompts people to study history is welcome. The bones have now been proven to be those of RIII thanks to DNA testing of a Canadian descendant. The historical fiction I read as a teenager started my fascination for history & it's never left me. I read more historical non-fiction now than fiction but I still love my favourites like DOT. I still read every book about Richard I can find. While it is true that miners were not shot at Tonypandy, other things happened. During the period of martial law in the Rhondda my own father, when a young child, was kicked and threatened with rifle butts by soldiers manning a checkpoint at the bottom of Graigwen hill in Pontypridd. This was because he tried to interfere when the soldiers thought it amusing to indecently assault my grandmother as she returned home from shopping. So no dead miners but lots of other brutality.